Jane Iredale known as the Skin Care Make-up, has been frequently voted 'Best Make-up' in many magazine polls both in the UK and overseas. It is featured on the 'Safe Cosmetics List' of Breast Cancer Action, which names cosmetics companies that don't use parabens or phthalates in their products. The Jane Iredale line is so safe and beneficial to use that it is recommended by Plastic Surgeons and Dermatologists throughout the world. Jane's line is a highly-sophisticated blend of minerals and pigments which are micro-pulverized, using proprietary technology and processes to form microscopic flat crystals. These crystals overlap each other on the skin to form a filter that allows the skin to breathe and function normally while still protecting it from air-borne pollutants. Formulated with SPF 20 the minerals give instant, broad-spectrum, chemical-free sun protection. The staying power of the minerals is so great that they rarely need a touch-up during the day. And because these silky-feeling powders are water resistant, they won't crease or smear even during the most strenuous exercise. Minerals will make your life simpler, because they’re a foundation, concealer, powder, and sunscreen all in one. And the sunscreen is UVA and UVB protective. 'Try before you buy': colour match foundation to achieve the perfect base for your make-up . Non-comedogenic, will not block pores. 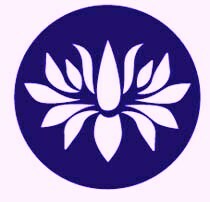 All products have been sensitivity tested. Broad-spectrum UVB and UVA protection - up to SPF 30. UVA tested at High. Complete coverage for skin conditions like acne, rosacea and redness following treatments like chemical peels and laser resurfacing. Contains no talc or parabens. Composed of inert minerals that cannot support bacteria. No products have been tested on animals. As part of the campaign to raise breast cancer awareness, Jane Iredale has launched a limited edition lip duo with their net proceeds going to Against Breast Cancer. A lip duo featuring two new universally flattering shades in a petite, portable keychain locket. 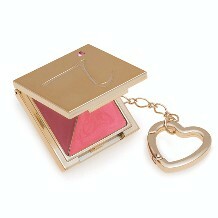 The locket contains two of our best-selling products: PureMoist Lip Colour (in Roses) – a pigment-rich, creamy lipstick that hydrates and soothes the lips with jojoba and grape seed extract; and PureGloss for Lips (in Lollipops) – a sheer, petroleum-free gloss made with green tea leaf extract. This Christmas, Jane Iredale is excited to offer a new edition of one of the brand's best-selling products for the lips, chocoholicks. These four new, delightful and indulgent chocolate truffle flavours are presented in a palette that resembles a sumptuous chocolate bar. 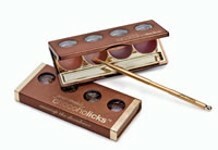 The palette also includes a retractable lip brush for precise application and clean storage. The streamlined design was created with the modern woman's desire for portability and easy application in mind. The shade range is intended to take a woman's look from day to night. The petroleum-free gloss uses pure-pressed peppermint oil to give lips high-shine and hydration, without stickiness. All natural flavouring from cocoa and fruit extracts are used for taste and aromatherapeutic benefits. The effect is an absolute feast for the senses. Blood Orange is a shimmering copper gloss, pairing the flavours of deep, dark chocolate and zingy blood orange. Espresso is a sultry, rich brown gloss tasting of bold, smooth mocha. Very Berry is a sheer plum gloss that tastes of luscious berries dipped in chocolate. Chili Pepper is a wearable red gloss combining sweetness and spice with the flavours of dark chocolate infused with exotic chillies. A new kind of eyeliner and highlighter that creates definition around the eye for a soft, smoky eye effect. A creamy powder formula that won't fade, crease or smear. Hypoallergenic, dermatologist tested and always formulated with exclusive skin care ingredients, Mystikol™ is safe for even the most sensitive eyes. Citrine: A shimmering combination of ochre and metallic bronze with a gold highlighter. Aquamarine: A cool swim through tropical blue waters with a rose highlighter. This wonderful self tan lotion from Jane Iredale is the most popular product of the Summer. 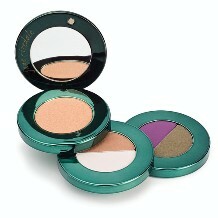 A moisturizing, natural bronzer and self-tanner for face and body that has a wonderful fragrance to it. Bronzer provides instant, healthy-looking color. This new self tanner stimulates melanin synthesis, allowing the shade to mimic your natural tanned colour gradually over three days. Ultra hydrating, long lasting shades. 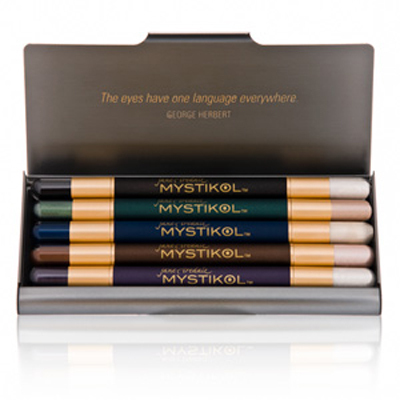 Each dual ended Lip Fixation has a lip stain and lip gloss in complimentary colours. Choose between new colours Passion (a cool cherry red with a clear gloss), Relish (a shimmery eggplant with a glittery clear gloss) and Mania (a warm golden bronze stain with a shimmering gold gloss) plus original range of Desire, Fascination, Craving, Fetish, Devotion and Rapture. 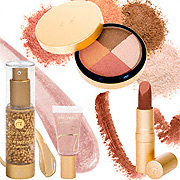 Flawless makeup results are in view with the Eye Steppe compacts from Jane Iredale. Five sensational shades handpicked by Jane to flatter either brown, green or blue eyes come nestled in a well-rounded compact with a mirror. Hypoallergenic, and dermatologist tested, of course! goBrown - Sea Green, Blue Sky, Tan, Forest and Licorice. goBlue - Oyster,Rosy,Tape,Swiss Chocolate and Smoke. goGreen - Allure,Iris,Sepia,Slate and Grape.